December is a wonderful month (hello, Christmas), but it can also be INSANE! Between Christmas concerts, Christmas concert practices, special Christmas dinners, sleepy students due to community events, an abundance of SUGAR and chocolate, rogue elves on the shelves, and general excitement and anticipation, it is no wonder our students are bouncing off the walls. In my opinion, the best way to get through the December/Christmas crazies is just to embrace them, and accept that this month is probably going to be a bit more chaotic than the others. 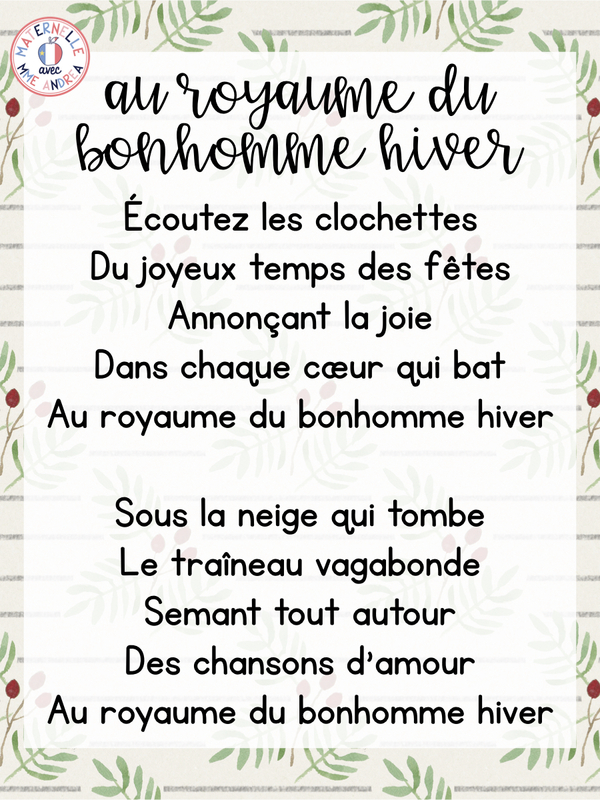 In my classroom, I happily accept my students' joy and immense love of everything Christmas-y, and use it to keep their engagement as high as humanly possible. We do Christmas literacy centres, we do Christmas math activities, we read about Christmas, we write about Christmas, and we SING about Christmas! 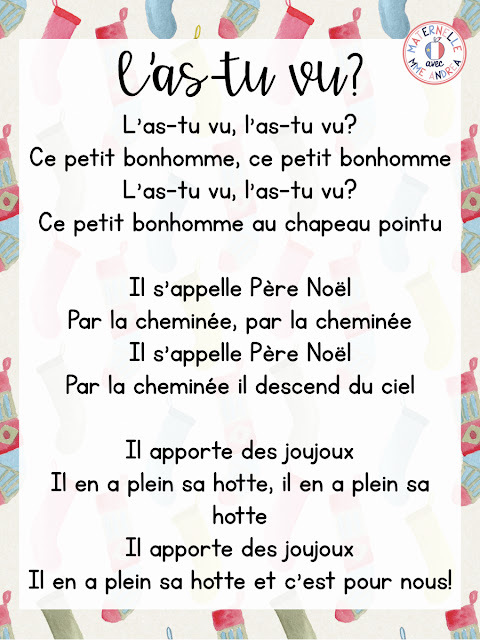 Les chansons et les comptines are so, so important in maternelle, especially in a second-language classroom. We try to sing all year long, but I really kick it up a notch in December! 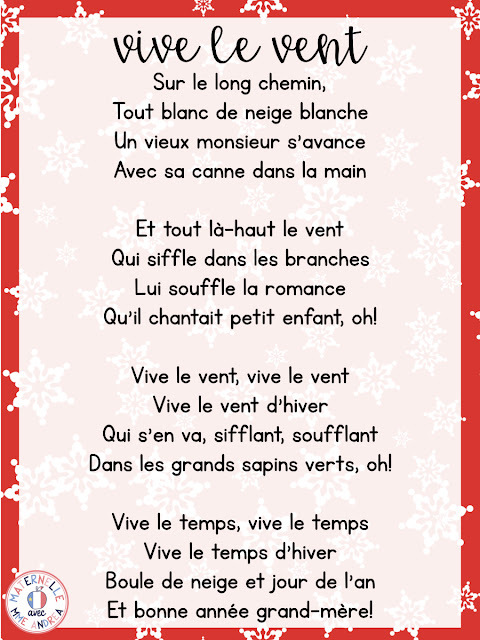 My students are definitely more excited for Christmas songs and poems than any other kind of song or poem. 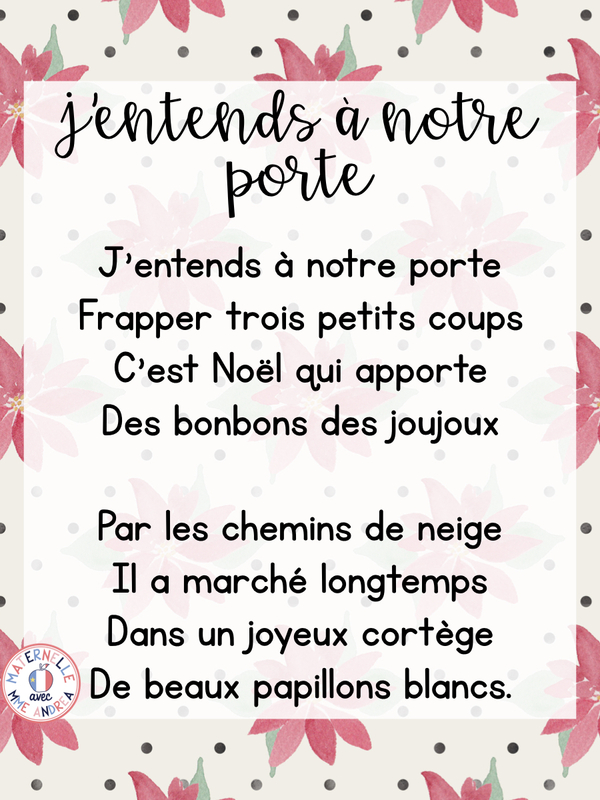 Read on for my top 5 French Christmas songs to learn in maternelle! Songs and poems are important in the primary classroom for so many reasons. 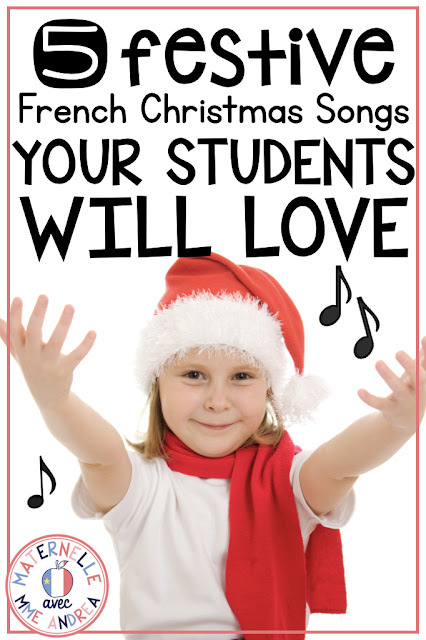 Songs and poems help develop students' listening, speaking, and reading abilities. 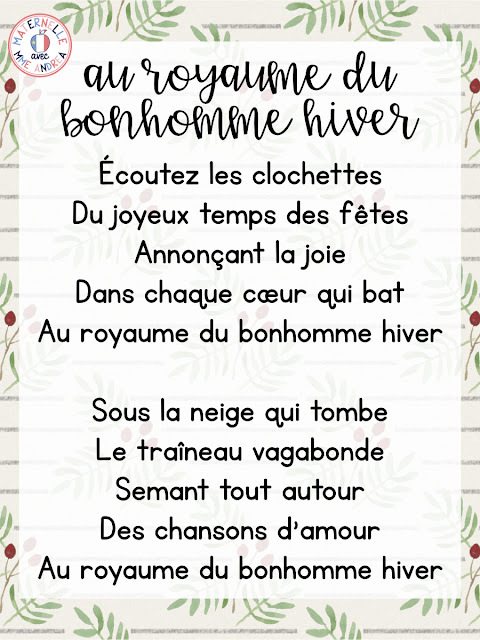 And, they are even MORE important in the second-language classroom, because songs and poems help our students learn and remember key vocabulary, sentence structure, and the natural sounds of the French language. There is a reason why you can remember every single word to a bunch of the songs and nursery rhymes you sang as a child, but can't remember where you left your wallet! But truly, if your students are struggling to remember a certain word or concept, or if they are incorrectly using a certain sentence structure over and over, songs and poems are the easiest way to fix it!! Here are five of my favourite Christmas songs to teach my students every December. We work on one song a week during the five weeks leading up to Christmas break. We sing them, act them out, find and circle sight words or sons composés, and talk about new words. At the end of the week, I draw one student who gets to take the song home to keep FOREVER! It's a super big deal!!! 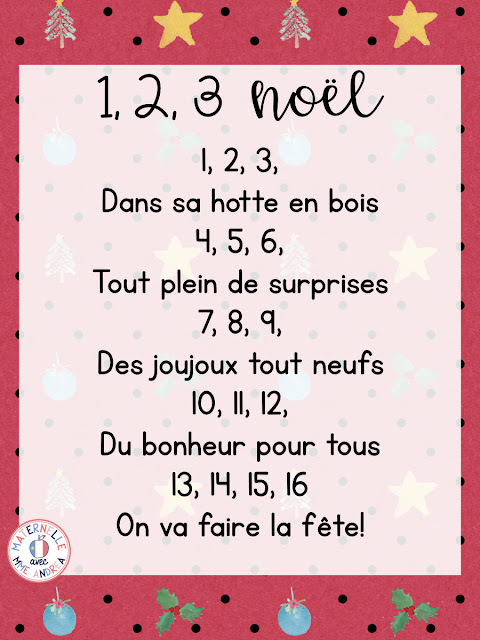 And, if December is feeling beyond crazy to you and you need more than Christmas songs to get you through, I can help! First of all, if you are feeling overwhelmed by the Christmas crazy, just breathe :) You will get through it, and there is a lovely break at the end of the tunnel! 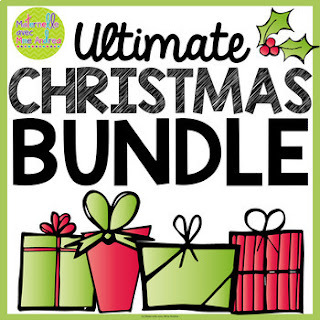 Then, if you decide that you need extra resources to get you through, check out my ULTIMATE CHRISTMAS BUNDLE. It is a collection of every Christmas resource I have ever made, and every resource I ever will make, as well. Some are NO prep, some are low prep, and some require a bit more prep. But all of them will help keep your kiddos learning and engaged all throughout December, and they will help give you back some downtime! Because we all need a little more downtime in December.